During an inspection of wheat in March 1996, spores that carry the wheat disease Karnal bunt were discovered in Arizona wheat. This was the first time Karnal bunt had been found in the U.S. The Animal and Plant Health Inspection Service (APHIS) declared an emergency, quarantining Arizona wheat from March until October of 1996 and instituting an intensive eradication program. 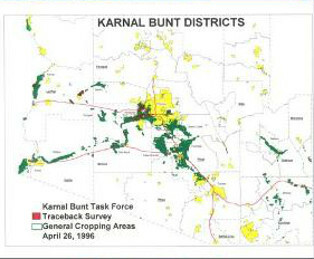 When was Karnal bunt discovered in Arizona wheat? Who created the documents linked above? For what purpose? Who else might have created documents about Karnal bunt in Arizona? Is their perspective shown in these documents? Do you think the APHIS’ stance on Karnal-bunt contaminated wheat was justified? Why or why not? If you had been in charge of the eradication, how would you have handled it, and why?